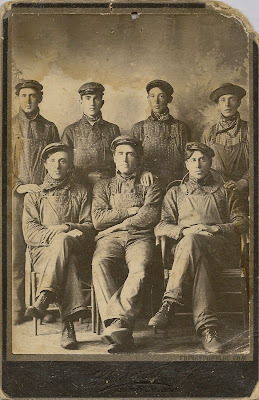 Nice, albeit a bit ragged, occupational cabinet card featuring railroad workers. Purchased for a couple dollars at an antique store in Rogers, MN. I thought it had a lot of character, and occupational cabinet cards are not that common. You can go through thousands of cabinet cards at an antique store and only find one or two, if that. That's a nice one and, to me, the ragged corner just gives it a bit of character. Good point. With certain collectibles, looking too "mint" almost makes them look like reproductions so I guess the wear does add to the character and sense of age. Would you consider selling this? I'm working on a collection of old railroad photos and came across this on your site. It would be a great one with the unique shirts and overalls they are wearing. I appreciate your interest but none of the items in my collection are for sale currently.